The tour itself was great. I have a complaint about the Viator App. When I opened the app, it just sat and spinned. It would not open. Other apps worked at the time, so it wasn't my phone. We had photos of the tickets so that helped us get on the bus and boat. The app issue caused a lot of anxiety. A great way to see Paris by both land and water, especially if you have only one day to do so. We used it as a means to identify places where we would spend more time on our next trip. Definitely worth the price. One problem was that our bus driver did not understand our receipt so as to give us the necessary tickets for both the bus and boat tours, but rather took us to a busy office where a clerk had to rectify the matter. As such we lost easily one hour of time that we should have used to enjoy our tour or see the sights. Buses not heated! We were so cold and unhappy with the bus experience we skipped the cruise. Bus stop 13 by the Arc is under construction and the stop has been moved 100 yards ahead with no notice. The bus driver drives right by. Considering how cold it is outside in January and how few stops are near a shelter, it was extremely upsetting to waste 20 minutes of freezing at an obsolete stop and have to try again another 20 minutes. The buses are very frigid inside in winter. Take the Red buses by City Seeing. Covered completely and warmer. I, along with my daughter and two nephews, had a very bad experience with your service in Paris. We bought an electronic ticket and we had with us a printed copy. As per your instruction we went to the closest open tour bus stop to validate our ticket. Once the bus arrived, the driver informed us after examining the printed ticket for some time the he couldn't validate it because his system was down. He also informed us that no other driver could do it either because the whole system was down and not just his. He advised us to walk to another bus stop stop 6, if I remember correctly where the driver can take us to the office to validate our ticket. The driver at bus stop 6 advised the same thing and agreed to take us to the main office where he said and we expected our ticket to be validated, what we didn't expect, however, is for the trip to the office to take about two hours during which we couldn't hop on and hop off. At the main open tour bus office, the lady in charge categorically refused to validate our ticket, claiming that it wasn't purchased from 'them', meaning perhaps it wasn't directly purchased from the open bus tour company but through a third party. She insisted that the only place where our ticket can be validated is the Bateaux-Mouches office to which we had to ride another bus with no possibility of hopping on and off. 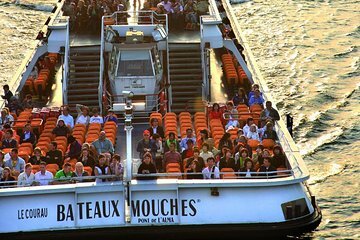 At the Bateaux-Mouches office everything went smoothly and we had an enjoyable boat ride, but at the end of it we were all tired and we had to call a day. I will be in the States in few weeks, and I may publish this review on some sites to alert future travelers from some of the pitfalls that may await. I had problems finding the bateaux company I needed to board, then I was so exhausted I gave up. That was a disappointment for me, as I was looking forward to that more than the bus ride. I did enjoy the bus ride. Overall It was really good. Paris is fantastic city that I really enjoyed.